Your Silksleep purchase is completely risk free. If you are not entirely satisfied with your purchase for whatever reason, let us know within 7 days. As well as offering free delivery, we are so confident in our products that in the unlikely event that you are unsatisfied, we offer free returns for our UK mainland customers. All of our silk duvets are filled with 100% naturally hypoallergenic long-fibre silk, free of harmful chemicals and artificial colourants. We've taken the time to source quality, reliable suppliers to ensure that Silksleep products will last for many years to come. Unlike alternatives, our range is exclusively 100% Grade A Mulberry silk, containing no offcuts, factory seconds or silk from mixed sources. 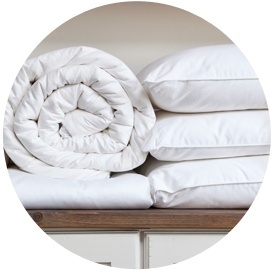 The filling of each of our duvets, boasting a thread count of over 400 and a momme weight of 19, is encased in fine, 300 thread count cotton sateen covers. We are a UK based company operating from the West Midlands. We value our customers, processing orders and replying to queries as swiftly as possible. Whilst ordering through our website is quick and secure, we are also available to take your order over the phone.